NOTE: We now offer the plastic Timing Chain Guide for the top of the electric timing chain adjusters or actuators separately! So, if you're purchasing anything but the FULL or FULL PLUS Kits, make sure to add 2 of the following part to your order: Guide Rail, Upper for Electric Adjuster, Driver or Passenger Side (OEM) for B6-B7 S4, C5 A6-allroad w/ Chain 4.2L. You can go back one section and add this product to your cart or search for 'electric adjuster guide rail' in the search box. The local Audi service departments we talk to recommend performing this service when your vehicle reaches 100,000 miles, with that being said we've seen symptoms of various forms of timing chain failures much sooner than that. With that being said the chain system on these cars should technically last the 'lifetime" of the car but unfortunately for our customers the engineers who designed this setup were wrong and failures occur regularly much earlier than even 100k. We are just here to help with parts and information to help you make your own decision based on the actual facts of what happened with these cars in the real world. This is in addition to the calls we receive from our customers on a weekly basis regarding some form of timing chain issue with their car. We have regularly seen the famous chain knock on cold start with cars that are quite new. This has been accepted by most due to its normalcy. The big concern is when they knock on warm restarts and can slap and damage other components or collapse at high rpm. We have also seen complete failures of guides and or the mechanical cam adjuster as early as 50k to 80k. Guide failures can lead to more damage to other components. If you have one mechanical cam adjuster fail, it causes one half of the motor to miss fire and sometimes damages the very pricey electric cam adjuster actuator which is included in our FULL and FULL plus kit. With that being said if your car has made it to 100k with minor or no issues it isn't a bad idea to do the service regardless to prevent damage to other components or getting stranded by a car running on half the cylinders. We see and hear of VERY few that fail in the 110k plus range. That doesn't mean they don't last on some cars, we just get more calls and local work on cars under 100k. 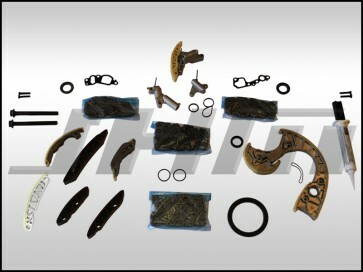 This kit includes EVERYTHING you will need to complete your Timing Chain service. In addition to all of the o-rings, seals, and stretch bolts needed, you will also receive each of the 4 different chains that are required, 2x UPDATED Electrical Cam Adjuster Assemblies, 2x Mechanical Adjuster Units, all of the chain guides and tensioners required including an updated version of the guide that fails most often featuring additional reinforcements. This kit includes everything featured in the FULL PLUS Kit except for the Timing Chains: all o-rings, seals, and stretch bolts needed, 2x UPDATED Electrical Cam Adjuster Assemblies, 2x Mechanical Adjuster Units, all of the chain guides and tensioners required including an updated version of the guide that fails most often featuring additional reinforcements. This kit includes everything featured in the FULL PLUS kit except for the 2x UPDATED Electrical Cam Adjuster Assemblies and associated seals and bolts: all o-rings, seals, and stretch bolts needed, each of the 4 different chains that are required, 2x Mechanical Adjuster Units, all of the chain guides and tensioners required including an updated version of the guide that fails most often featuring additional reinforcements. 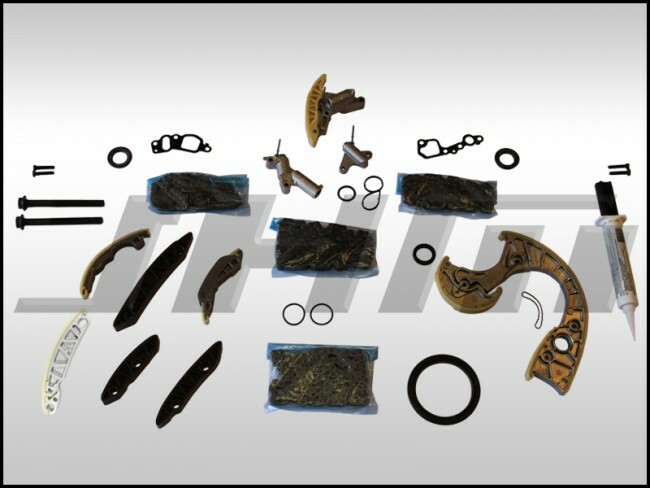 This kit includes everything featured in the INTERMEDIATE PLUS Kit except for the Timing Chains: all o-rings, seals, and stretch bolts needed, 2x Mechanical Adjuster Units, all of the chain guides and tensioners required including an updated version of the guide that fails most often featuring additional reinforcements. This kit includes everything featured in the INTERMEDIATE PLUS kit except for the Mechanical Camshaft Adjusters. It will include all o-rings, seals, chain guides, and tensioners required including an updated version of the guide that fails most often featuring additional reinforcements. NOTE: There is a VIN split for one of the Cam Chain Tensioner Guides included in this kit. The split has to do with the design of one of the oil orifices on the back of the motor. Most 2004 B6-S4s and a small number of 2005 B6-S4s had an EARLY version of this part. You must check your VIN to be sure. Vehicles with VIN up to 4 200 000 will require an EARLY version of this Guide. Vehicles with VIN from 4 200 001 on will require the LATE version of this guide. B7-S4s all had the LATE version. Please confirm your VIN and select the version you need from the drop-down below. This kit includes everything featured in the INTERMEDIATE PLUS kit except for the Mechanical Camshaft Adjusters and Timing Chains. It will include all o-rings, seals, chain guides, and tensioners required including an updated version of the guide that fails most often featuring additional reinforcements. This kit features the minimum amount of parts required to perform a Timing Service. You will receive each of the 4 timing chains, the chain guide tensioners, and the updated version of the chain guide that fails the most often featuring additional reinforcements. This kit will also include all of the o-rings, seals, and bolts required to change these minimal parts. This kit features the minimum amount of parts required to perform a Timing Service. You will receive the chain guide tensioners and the updated version of the chain guide that fails the most often which features additional reinforcements. This kit will also include all of the o-rings, seals, and bolts required to change these minimal parts. For shipping quotes: Please sign in or join then put the items you want in your shopping cart and proceed to checkout. © 2006 to present day JH Motorsports, Inc. All Rights Reserved. JH Motorsports is not affiliated with or endorsed by Audi AG, Audi of America, Volkswagen AG, or Volkswagen of American or any other car company mentioned or whose logos are displayed in these web pages or our store. Audi®, Quattro®, Avant®, A4®, S4®, A6®, RS4®, RS6®, Allroad®, TT®, and Tiptronic® are trademarks of Audi AG. Volkswagen®, VW®, Golf®, Jetta®, Passat® and Beetle® are trademarks of Volkswagen AG. While we try to keep everything current, JH Motorsports is not responsible for errors in pricing on this web site. All prices are in US Dollars. Some of these modifications and or parts are intended for off-road use only and may violate Federal or your State emissions standards. Also, end user assumes all risk with product performance and installation. JH Motorsports is not responsible for any bodily or mechanical harm, etc. as a result of use or misuse of any products.